...ah yes, I thought. That's the sequel, all right. 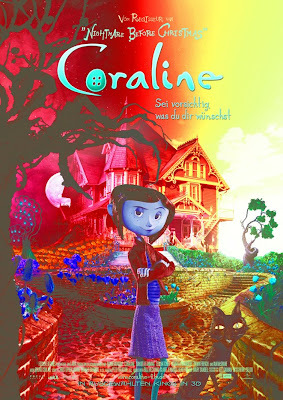 CORALINE APOCALYPSE. And I just got a note from a happy Henry Selick to say that Coraline is now the second highest grossing stop-motion film ever (Chicken Run is the first), and I am proud of him. Why are the Absolute Sandman volumes so expensive? I can't even afford half of one! They aren't that expensive. Well, they are, but that's because you pay for what you get: you're getting 600+ pages of full colour comics, newly coloured, and new material, bound to last, on good quality paper, hardback and cased. They're a hundred dollars each (they were half that through Amazon on release, and can still be found for around $60 if you poke around online.) Paying full price it'll cost you $400 for the set. (That's about $240 on Amazon "new and used"). They weigh about seven and a half pounds each. There are ten Sandman Books out in paperback, which will cost you, at full price, a hair under $200 -- and which are still in print, and can be found much more cheaply. The printing, paper and colour isn't as good, and they tend to discolour with the years. But it's the same story. Is your Luminato reading already sold out? I wanted to take my son, but every time I try to buy tickets through ticketmaster, it tells me that the seats I want aren't available. I tried and tried to got tickets to your reading at Luminato in Toronto. The presale code didn't work, calling in with the code got me nowhere. So, like an idiot, I figured it must not work for anybody and that I would be safe. I wasn't. They were sold out by 10:02 yesterday, according to Ticketmaster. Will you be doing a reading or even a signing anywhere else while you're here? Or, is there anyway to get Luminato tickets elsewhere, or even attend the signing without a ticket (I'd love to see the reading, but that doesn't seem possible)? ..so it looks like the 500 seats sold out in two minutes, I'm afraid. I don't know if I'm doing any other public events at Luminato. (I think I'm doing some school events.) I'll post what I find out.